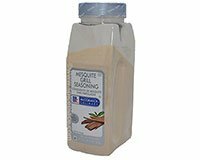 McCormick's Mesquite Grill Seasoning has a strong mesquite flavor and aroma enhanced by salt and sweetener that will impart the taste of a food cooked over an open fire in the southwest. Sprinkle McCormick Mesquite Grill Seasoning on poultry, fish, pork, or hamburgers and grill or pan fry. Use Mesquite Grill Seasoning in place of salt on French fries by sprinkling on after cooking. Use Mesquite Grill Seasoning to add mesquite smoky BBQ flavor to cheese or barbecue sauces. Sprinkle on vegetables prior to grilling. Ingredients: Salt, Maltodextrin, Matural Mesquite Smoke Flavor, Natural Grill Flavor (From Partially Hydrogenated Cottonseed and Soybean Oil), Modified Corn Starch and Caramel Color. Allergy Information: Contains Soy.